While we are known for machining the tightest of tolerances right on the machine (+/- .0002”), sometimes an additional process is needed to get the length or outside diameter to the next level of high precision. That’s wherelapping and grinding come in. Many of our customers who use high precision rollers, bearings or shafts in their application find our high quality, tight tolerance screw machine parts improve their product’s performance. Extreme Dimensions? With our proprietary lapping and grinding processes, we can guarantee lengths to .00002” (20 microinches) and diameters to .000003” (3 microinches). Even tighter tolerances can be had with a secondary sort. Extreme Surface Finish? By combining our lapping and grinding processes with our special polishing, we can provide you with the highest of surface finishes. Extreme Profile? 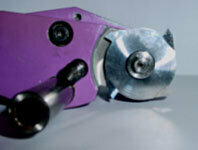 We can use our grinding process to create the profile your application needs! Because we make our tight tolerance parts on high precision machines, we can spend less time bringing them to extreme tight tolerances through lapping and grinding, saving our customers time and money. Contact us today to see if we can help with your “extreme” requirements! Tolerances: No tolerance is too tight for us. 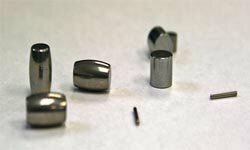 At Micro Precision Components, we routinely hold +/- .0001″ or better. 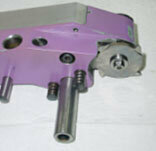 The more critical the part, the more cost savings we can offer! Drilling: Drill up to, and sometimes exceed, 20:1 drill ratio from brass, complete on the machine. Finish: We produce a 16 microinch or better on the machine. Higher microinch finishes can be done on the machine using special tools. All of these add up to better quality at better prices! One of Micro Precision Components’ specialties is our ability to make complex shapes, threads and configurations at full production speeds without costly secondary operations, thanks to the polygon milling attachment. Making square, hexagon and octagon shapes complete on the machine from bar stock are some of the more traditional uses of this device. The spindle rotates at about 10,000 RPM, while the polygon cutters repeatedly engage the material at the same location. Depending on the number of cutting tools and their shape and location on the spinning tool head, various shapes are made. The polygon makes a very high quality thread and allows us to make threads in places where traditional tools cannot be used. In addition, we can save even more time by simultaneously creating the thread AND the slot on a screw, while the spindle continues spinning at full speed. The polygon only mills copper and aluminum alloys and some mild steels. But give us time, we’ll find a way to polygon the harder materials! We worked closely with tool designers to develop a tooling head that is not much larger than a half dollar coin. This is unique in the market and allows us to utilize our smaller M4 (4mm) Tornos cam machines. These machines can better handle the small wire stock used to make miniature parts like the one in the sample bag. Our Micro Precision Sample Notebook has some excellent examples of polygon applications that reduced our customers’ costs while providing them with a higher quality part and product. Contact us to set up a convenient time to review our capabilities with a sales representative.